The non-clinical spotlight series exists to shed light on all of the interesting paths that physical, occupational, and speech therapy professionals have taken. 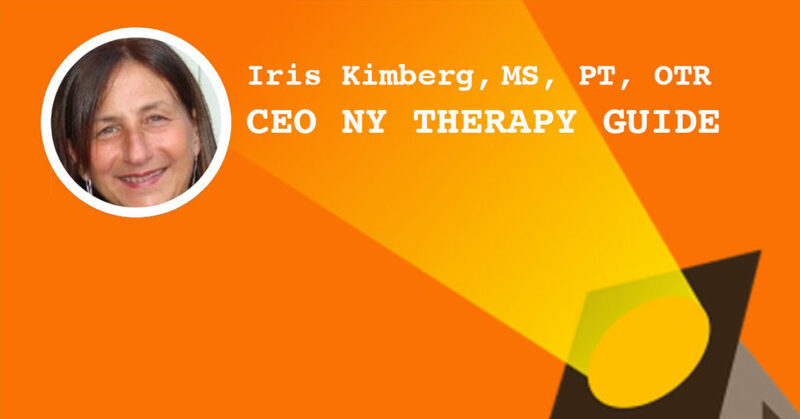 Today’s spotlight focuses on Iris Kimberg, who went from occupational therapist to owner of a successful multi-disciplinary, multi-branch rehabilitation agency—and now to CEO of New York Therapy Guide and PrivatePracticeOpportunitiesandGuidance.com, where she serves as a private practice consultant. Where did you go to PT/OT school, and when did you graduate? Why did you opt to get both a PT and OT degree? I started my private practice early on as an OT in private home care, and quickly also got referrals for PT. When I found out (the hard way!) that it is not legal for an OT to hire a PT in my state of NY (disparate professionals cannot hire each other), I opted to solve the problem by becoming a PT. Fast forward to 2018—the law still exists, but there are other ways to solve the problem. How did you wind up starting in private practice? I started out working at the renowned inpatient rehabilitation center in New York City, The Institute of Rehabilitation Medicine, aka Rusk Rehabilitation. When patients were discharged home, they often asked their treating therapists to see them at home after discharge. A need was clearly identified: follow-up care at home after a hospital stay. I spoke with the department head twice telling her we needed to start a home care program at the Institute. How did you wind up growing your practice? Over the course of 25 years, I grew the home care practice into a three-branch office, with 700 affiliated therapists, generating $14 million in revenue. We always continued to have a home care division, but went on to include other divisions for services in both schools and early intervention settings. Were you still a treating clinician at this time? Early on, I saw that that growing my company meant I had to give up direct patient care to focus on the business and management end. Therapists today know they can ask me any business-related questions, but not clinical ones! The vision of the company was always based on supply and demand in the industry—tempered with how to keep growing, without sacrificing the quality of services we provided. Where does NY Therapy Guide fit in? When did you start it and why? When I sold my company in 1996, I was under a non compete clause and could not work for three years in the industry. During that time, my idea to be a consultant was conceived. After the initial thrill of not working wore off, I realized how much I missed interacting with all the therapists I had grown to know through my company. Many began to call me at home, and eventually the talk would turn to therapy. My colleagues assumed that since I had achieved professional and personal success for myself, that I could help them in their own path to success. I clearly saw that there was a need for a consulting company where therapists already in private practice (or thinking about private practice) could turn for advice in this rapidly changing and competitive health care market. At the time there were few to no consultants in the marketplace serving private practices—now of course, the marketplace is flooded with therapists who claim to have the “secret sauce” for success. Over time, I grew my one-on-one consulting services to include other offerings, and also engaged in other endeavors, all feeding my consulting practice. What do you do these days in your role? I have an active “caseload” of over 350 therapists across the country and Canada that I work with on an “as needed” basis. A typical week for me can be in-person consults with therapists in my neck of the woods ( I divide my time between NYC, upstate NY, and Florida), and out-of-state phone, Skype, or online meetings with therapists who are either starting out, having growing pains, or beginning to think of their exit strategies. I work on long, involved projects like answering RFPs—as well as short, one-time consults, like writing an effective marketing letter or helping therapists revamp their websites to better present themselves and get their messages out. I do at least four live webinars per year on topics related to the business practices of private practice. I am continuing to challenge myself to step outside of my own box. I created a second website, PrivatePracticeOpportunitiesandGuidance.com, because 55% of my work is now outside of my home state of NY. I am committed to sharing information with the new generation of therapists that my generation will be passing the torch to. One of my main goals is making sure the information that is shared online is accurate, and that therapists examine issues related to the business end of their practice from all the necessary legal, fiscal, and ethical perspectives. I have been forming more strategic alliances with therapists in creating factual and actionable content related to the business aspect of therapy provision, and always find time to help get the word out about charitable causes and humanitarian projects that therapists are involved with around the world. My next personal goal is to try to get business content and courses integrated into many of the online DPT and OTD academic programs across the country. There is still a significant lack of information that is integrated into these programs and I think it is critical to the longevity of our profession. Do you have any book/podcast recommendations for other aspiring entrepreneurs? Do I have any? Or Many? Or too many! Here is a sampling of the many webinars I have available on my website– I continually update them as new trends emerge, laws change, and marketplace conditions are altered. Thanks for your insight, Iris! Thanks for featuring me – I appreciate the acknowledgment, and was one of the original therapists who started to “preach not practice”. NICE article on Iris. Thank you. Thanks, Nancy! I’m going to reach out at this email and (hopefully) feature you soon, too!